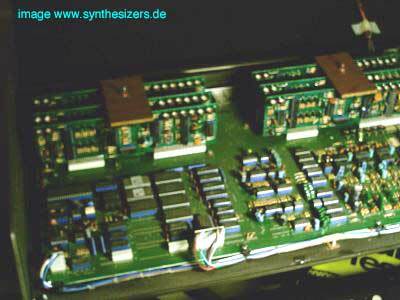 what chips work in your Hardware Synthesizer?- more in the WIKI Section – Hardware Chips in Synths..
CEM = Curtis Electromusic Specialities – s special analogue small scale chip. no navigation? you came here by some link?? CLICK HERE, to get it back!! DSPs – what DSP in what synthesizer? 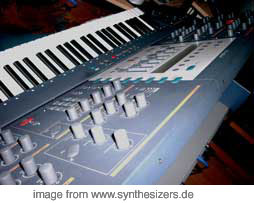 welcher DSP in welchem synthesizer? 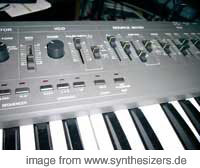 more in the WIKI Section – Hardware Chips in Synths..
(3 of them in the Q KB and raQ, where 2 are for the synthesis and 1 is dedicated to FX only! TI TMS320VC5502 16bit, fixed-point digital signal processor – based on the TMS320C55x DSP core – src. 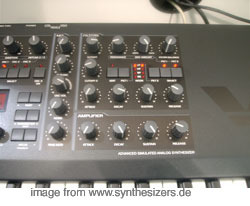 The Nord Modular has 4 (expandable to 8) Motorola 56303 DSPs. Akai AX-60 uses 2xMN3101 and 2xMN3009 for it’s chorus. DS2: is digitally controlled, not necessarly digitally generated (means: DCOs..) filters: don’t know so far. an AMD am29F010B ambit flash memory. more v’ger see my moog page.. 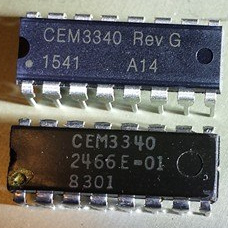 Both Matrix use six CEM3396 ‚Synth on a Chip‘, M6 has wide body version (600mils), M1000 the small (300mils) one. 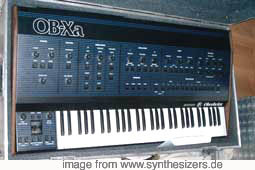 Both Matrix synths have DCOs. Master clock is derived from a quartz on the Matrix 1000 and from three free running, software calibrated (voltage controlled) oscillators on the Matrix 6. M6 has a 4 to 2 split mode, the M1000 lacks this hardware, otherwise the voices are (nearly) the same. 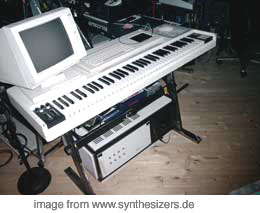 old definitiion: Matrix 6 and Matrix 1000 differed in the way that the M6 had a couple of Curtis chips to generate a voice while the M1000 used a „synth-in-a-box“ chip from Curtis that had the whole voice in one IC. Even the „Wave“ selection feature was packed in there. I only don’t know if Curtis developed this chip because Oberheim wanted them to do so. So, if someone wants to build his own analog synth, he might start with that chip. It’s not the best sounding chip but very easy to build control circuitries around it. On the web, you might find interesting information about SSM and CEM chips. (D) Beide Matrix verwenden sechs CEM3396 ‚Synth on a Chip‘, der Matrix 6 im breiten, der Matrix 1000 im schmalen Gehäuse. Beide Matrixe haben DCOs. Der ‚Masterclock‘ beim Matrix 1000 kommt aus einem Quarz, beim Matrix 6 werden drei softwareabgleichbare (spannungsgesteuerte) freilaufende Masteroszilatoren verwendet. Der Matrix 6 kennt einen 4 zu 2 Split-Mode, dem 1000er fehlt die Hardware dafür, ansonsten sind die Stimmschaltungen (fast) gleich. filters made with an extra ciruitry in the servical manual a one percent resistor array. this chip provides LPF 4pole filter only! 2 processors running at 16mhz. there is also the noise gen on the processor board! the first is responsible for the display and encoders, the other is for env and lfo generation.. The PPG Wave (2.0) series used the SSM filter. even the ju8 has no curtis filters.. same for the ju6.. The older revision usesr IR309 filter like in JP4, JP8, Juno60 etc. The newer MKS uses IR305 which is both VCF and VCA. like in Juno1/2, JX-10 etc. 2 x Waldorf custom ASICs. also thanks to Than Muir for add. help /corrections!